This is a copy of Pat Choate’s review of The Decline and Fall of the American Entrepreneur: How Little Known Laws and Regulations are Killing Innovation. Dr. Pat Choate, economist, former Vice Presidential running mate of Ross Perot 1996, Director of the Manufacturing Policy Institute, Phd. Economics University of Oklahoma. 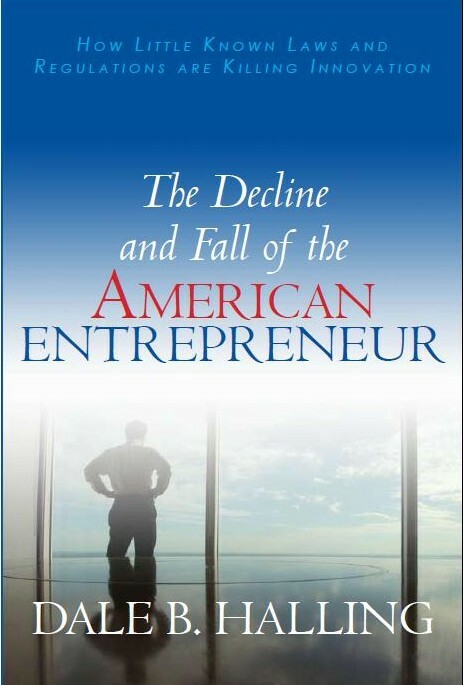 I do not review books on the Net unless I find them well-written and especially informative, which certainly applies to Dale B. Halling’s The Decline and Fall of the American Entrepreneur. Nonetheless, I do have a criticism directed towards the publisher. My copy did not contain a vita of the author, which in this case is a major omission. Mr. Halling is a physicist, lawyer and an expert on patents and entrepreneurship, all of which comes through in his book. This author delivers the goods. A vita in subsequent printings would be useful. Mr. Halling combines two topics — the impediments to entrepreneurship that have been created by the U.S. government as an unintended consequence of its pursuit of other goals and the systemic weakening of the U.S. patent system by the U.S. Supreme Court and the Congress. The resulting technological stagnation is a major reason the U.S. has gone from producing 25 percent of the World’s Gross Product in the mid 1990s to about 20 percent today. The loss is significant – about $3 trillion of U.S. GDP in 2009 alone. He demonstrates in clear terms the linkages between economic growth, productivity, and income. And he lays out how technological advancement has always been the American advantage in global competition, an advantage that the U.S. is squandering. He explains how the Sarbanes Oxley Act cut off the waves of venture investment that did so much to stimulate U.S. growth in the 1980s and 1990s, and he also explains how shifts in accounting rules as per stock options directed many of our most creative people into less than innovative activities. His final chapter contains some straight forward recommendations that involve no direct-cost regulatory changes that would once again stimulate more innovation, investment and job creation in America. Amazingly, Congress is now considering a so-called “patent reform” legislation that would further diminish U.S. innovation. The author convincingly explains how this would damage U.S. innovation. He also explains the consequences of recent Supreme Court decisions on patent law. My observation is that the Roberts Court is the most anti-patent set of Justices in U.S. history. Once Congress understands what the Court has done, their decisions need to legislatively overturned. In sum, this is well-written, jargon-free, 137-page book that is a quick read. It evidences smart and practical thinking by an author with real world experience. I highly recommend it.